Signage designates the site of Soul City, North Carolina. Photo by Kate Medley. My dad moved us to the South in 1990 to work in a Black town called Soul City. We came to North Carolina from Detroit—a much bigger Black town—where my parents grew up. Dad commuted to work an hour each way, the lush low-density streets of Durham giving way to the even more lush rural roads of Warren County. 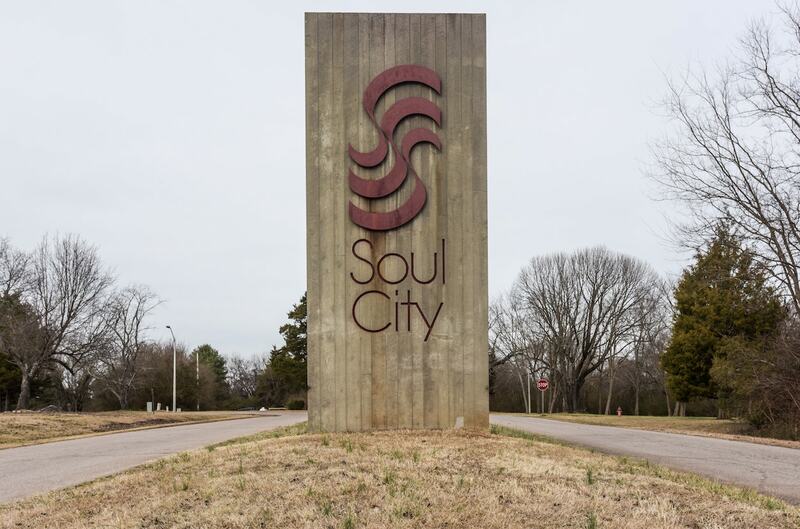 The sign for Soul City looked like the 70s version of the future—a towering flat grey column with red letters carved in sans-serif font. Every time Dad took me to work I felt like Dorothy in The Wiz, easing down a long winding road to a magic city in the middle of nowhere. The dust from the red clay that covered the ground clung to everything—your new Reeboks, your white tights, your freshly washed car doors. But there was so much land in that place, so much space for seven-year-old me to run, that by the time my mom saw me at the end of the day, my legs were red-orange, my hair liberated from the braid she had carefully platted that morning. My dad is a pediatrician, and the HealthCo Clinic in Soul City was his first job out of medical school. It was a medium-sized yellow and brown brick building neighboring business offices and the local manufacturing plant, called Soul Tech. Dad treated a lot of kids at the clinic, but there weren’t enough doctors to specialize, so he saw adults too. Years later, he told me that some of his patients were sick because they didn’t have adequate plumbing in their homes. I learned soon after that these conditions were not unusual in Black towns. In 2016, as I traveled with visual artist Torkwase Dyson through two other Black towns in North Carolina and Alabama, trying to understand why neither of them had sanitation infrastructure in the 21st century, I learned that Soul City was also a Black dream killed just as it was coming true. By the time my dad started working at HealthCo, it had already been 14 years since the Department of Housing and Urban Development defunded Soul City. Much of the several thousand acres of the former tobacco plantation Floyd McKissick Jr. (director of the 1960s civil rights group Congress of Racial Equality) envisioned as a safe haven for Black empowerment sold in foreclosure. It is now accepted that the State of North Carolina, instigated by now-infamous white U.S. Senator Jesse Helms, was largely responsible for the town’s demise. Helms utilized his connections at the Raleigh News and Observer—the second largest paper in the state—to launch a public investigation of fraud and mismanagement against McKissick and his administration. Without real evidence of the veracity of these charges—which were later proven false—the News & Observer published a five-part series attacking Soul City. Business investors backed away from the town and prospective residents changed their plans. McKissick’s Black dream came to an abrupt end. There appears to be little rationale for Helms’ hostile interference other than his transparent disdain for Black political leadership. People still live in the place that was Soul City. The sign is still there, but the promises are gone. McKissick managed to build a state of the art water system for his utopia, but never got a chance to build sanitation infrastructure. The story of Soul City is a version of the story of each Black town I’ve lived in, studied, or heard about in passing. Every time I tell one story in public, I come away with at least two more of the same, in every region, but especially in the South—where the Black town was born. The stories are about how white supremacy and its twin, anti-Blackness, intervene in the most basic life processes—drinking water, flushing toilets, possessing the voltage necessary to cook and wash clothes at the same time, being able to see the streets after dark. And how parties from every sector—from business to media to the state—participate to reinforce these conditions. We launched Scalawag’s Combating White Supremacy initiative after witnessing and covering two years of racial terror against Black and brown people. The violence is fast, brutal, and routine. The recipients of that fast violence are also already worn by the slow violence of denied employment and basic services, of struggles to compensate for those deprivations, of the time wasted appealing to structures that were not designed to respond to them. Our work then necessitates a view and a re-telling of white supremacy and anti-Blackness that is just as mundane as it is shocking. This work will take time and energy, ours and yours, that cannot be wasted if we do it right. Some years after my dad moved on from HealthCo, the State of North Carolina converted most of Soul City into a prison complex. HealthCo, which served residents across Warren County, closed in the late 2000s, also allegedly due to mismanagement. Soul Tech is now a soap factory where prisoners work for about 40 cents a day. McKissick fortunately did not live to see this final overthrow of his dream. But we see it now.